Today marks the last guest post from friends and fellow moms who have so graciously shared their time and recipes with you all while I’ve spent time bonding with my growing family. In fact, it’s brought to you by my friend, Sonali, someone I consider to be supermom. Seriously. All you have to do is read her intro and you’ll call her that too! Take it away Sonali [superwoman, supermom, The Foodie Physician]. These kid-sized barbecue cheddar mini meatloaves are flavored with barbecue sauce and studded with yummy cheddar cheese. I’m so excited to be writing this guest post, as I’m a huge fan of Katie’s! Just to let you know a little bit about myself, my name is Sonali- I’m an ER doctor, chef, and mom. When I’m not running around the ER or chasing after my daughter, I’m sharing my latest kitchen creations and nutrition advice over at my blog, The Foodie Physician. When I thought about the best recipe to share with you all, these Barbecue Cheddar Mini Meatloaves came to mind because they are the are the perfect family-friendly meal. These individual meatloaves are coated in sweet barbecue sauce and stuffed with ooey, gooey melted cheese- what’s not to love?! Plus, they’re easy to make and they freeze well so you can make a large batch of them and heat them up on busy weeknights. It’s just one of the many recipes in my latest cookbook, Natural Baby Food: Over 150 Wholesome, Nutritious Recipes For Your Baby and Toddler. I came up with the idea for this cookbook when I had my daughter Sienna. Even though I’m a physician, I felt completely lost when it was time to start her on solids! Starting solid foods is one of the biggest milestones in your baby’s first year of life and it’s an exciting time for parents. But it can also be confusing and intimidating, and most parents have a lot of questions, just like I did. So I decided that I wanted to create a comprehensive resource for parents to turn to where they could get the most pertinent medical and nutritional information, as well as a wide variety of nutritious recipes that would be useful for years to come. 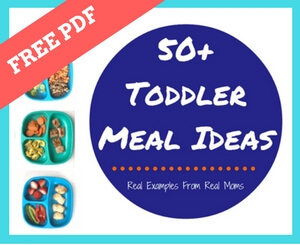 Mealtime doesn’t have to be stressful or intimidating, and you don’t need to be a highly skilled cook to make your own baby and toddler food. The truth is, it’s actually quite easy! So whether you’re a new or well-seasoned parent, I hope you’ll check out my book and try out some of the recipes with your children. And on that note, get your kids in the kitchen with you the next time you’re cooking dinner- it’s never too early to start. By spending time together and teaching your children to cook, you’ll be giving them invaluable tools that they’ll use for the rest of their lives. You’ll also be putting them on the path to lifelong good health and adventurous eating. Here’s a recipe from the book to get you and your kids cooking together. Place the ground beef, onion, egg, 2 tablespoons barbecue sauce, oats, pepper and cheese together in a large bowl and mix until combined. Line a baking sheet with parchment paper or aluminum foil. Divide the mixture into four equal portions and form them into loaves on the baking sheet. Brush each meatloaf with 1 tablespoon barbecue sauce. Bake 22–25 minutes until cooked through. Cool meatloaves slightly before serving. If you don’t have quick-cooking oats, you can make them by pulsing old-fashioned oats in a food processor until coarsely ground. Natural Baby Food: Over 150 Wholesome, Nutritious Recipes For Your Baby and Toddler is available wherever books are sold including Amazon, Barnes & Noble, Target and Walmart. Want to hear more from Sonali?! Be sure to check out her website and follow her on Facebook, Pinterest, Twitter, and Instagram! Thanks so much for letting me guest post on your site, Katie! I hope that your readers love the meatloaf and the book! I know they will!!! I already had someone email me a picture of the meat loaves they made!